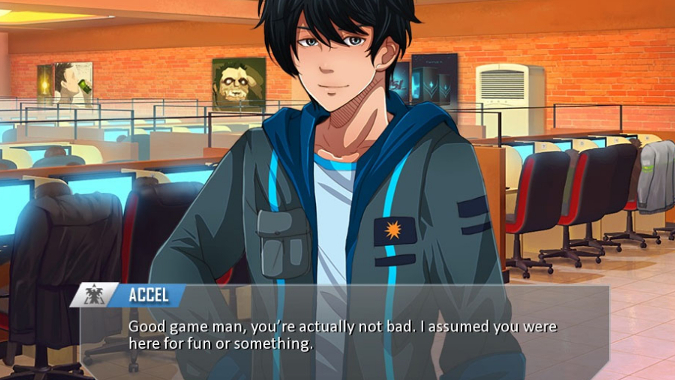 SC2VN is a new game in the visual novel style, exploring the lives of fictional StarCraft 2 pro players. You play a gamer new to the competitive scene in South Korea. You have to network and prove your skill in order to build the best team you can from the other gamers you meet. After being funded through a Kickstarter campaign and two years of development from some very devoted StarCraft 2 fans, it is now available as a free download on Steam Greenlight. The gameplay is a bit odd for people who haven’t played a visual novel style game before. The most famous example of that game genre is probably Ace Attorney (i.e., the game where the protagonist yells “OBJECTION”). You work your way through a comic book-style story, but you can make decisions which alter the course of that story. It should also be noted that Team Eleven Eleven reports that Blizzard gave them permission to use some of the StarCraft art assets and name in their game, thereby avoiding copyright issues and showing once again how much Blizzard values their fans. The developers, Team Eleven Eleven, are sure to point out that while having a bit of background in eSports in general and StarCraft 2 in specific can give an additional appreciation for the game, it definitely isn’t required to enjoy it. Indeed, the characters you have to work with in the game seem to be based on famed competitive players, and there are several subthreads in the release announcement on the StarCraft reddit speculating who each character could be. There are no romance options, disappointing many commenters. Perhaps it’s a good idea to avoid mashing together the faces of semi-real people and yelling now KISS! but even without that extra context it’s still a solid game. They kept the jargon in text to a minimum, while the art and music are both quite well done. Their team is still involved in the development process, noting that any typos found be relayed to @Voguekun on twitter.